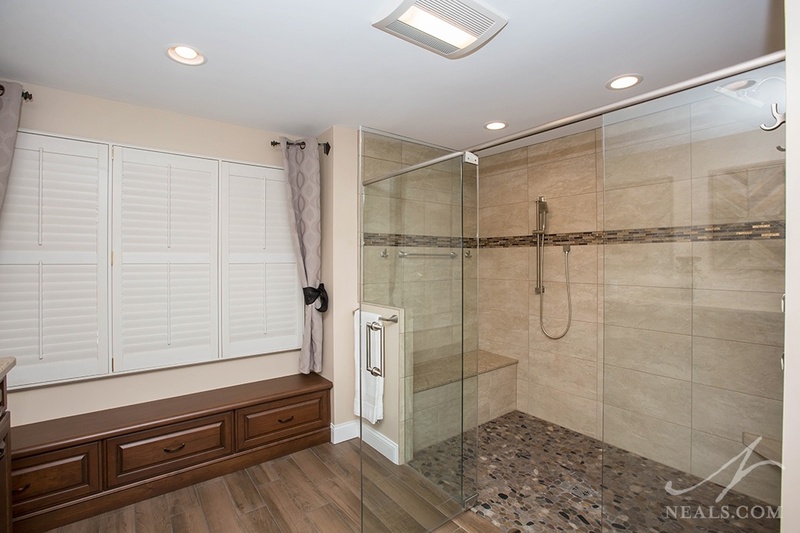 The roomy, double-wide shower in this Morrow master bathroom has different showering options on both ends. Most modern showers are a standard 3 ft x 5 ft space. That's big enough for an average adult to not feel too cramped. It also leaves some room for a bench. Smaller than this, and the shower begins to feel like an after-thought. Larger, however, moves into creating a more luxurious experience. Your home's space considerations will likely dictate how big is too big, but even a shower stretched one more foot in both directions, to 4ft by 6ft, long will feel like an ample space upgrade. 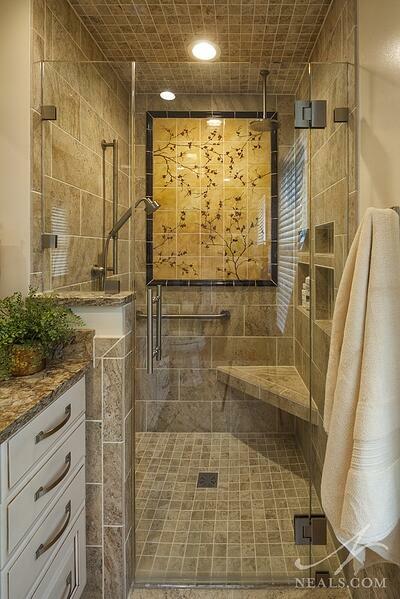 The more space you have in the shower, the more the other considerations change. Benches, additional faucets and shower heads, more niches, and more lighting come with more space to fill. It's best not to design a gigantic shower so large that spaces inside of it aren't put to use. Think about where the water will reach, and where a bench makes sense, and consider those as guidelines to your shower's physical limits. Privacy from the entry door on the right is maintained in this Western Hills bathroom with the use of a full wall, while the bay-style front is full-height glass which keeps the shower from feeling too closed in. 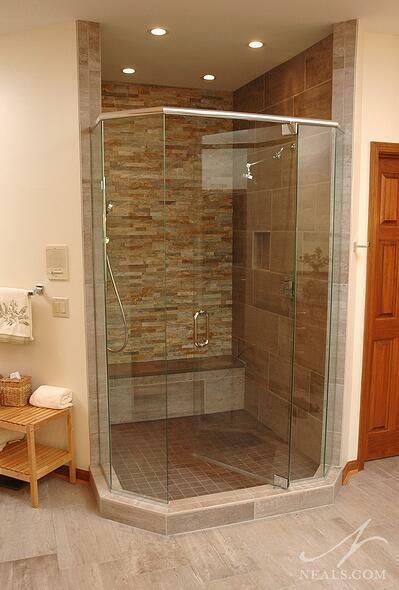 When it comes to enclosing the shower, there are several combinations of walls and glass that work. Your own sense of privacy and comfort are the dictating principles at work in this consideration. Some homeowners are comfortable with all-glass enclosures, while others prefer a mix of solid walls and glass. Paying attention to how the shower is positioned in relation to the door and any windows can help identify where additional privacy may be warranted. Walls, whether full or half, can also provide additional space for fixtures and niches. In some cases, these items can be placed on a wall so that they are not visible from outside the shower, which can allow the tile or other design details of the space to take center stage when the bathroom is viewed as a whole. Half walls can also work as the back to a bench. A newer trend is to include a window in a full wall, which can ease feelings of being enclosed in the shower without losing too much in the way of privacy. 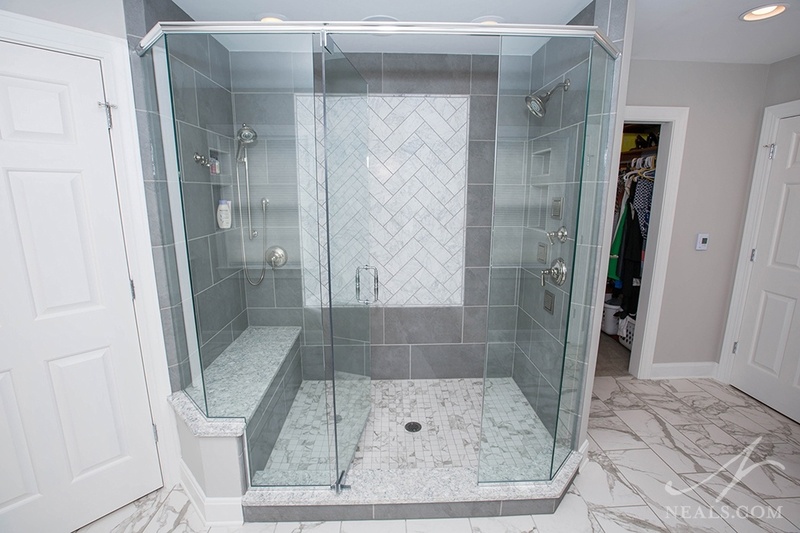 When thinking about the layout of the walls, also consider if the shower is large enough that the shower head can be placed in a way that a door isn't necessary. This works well for long showers. In this King's Mills bathroom, two zones with different shower heads and separate faucets allow for showering either standing or seated. 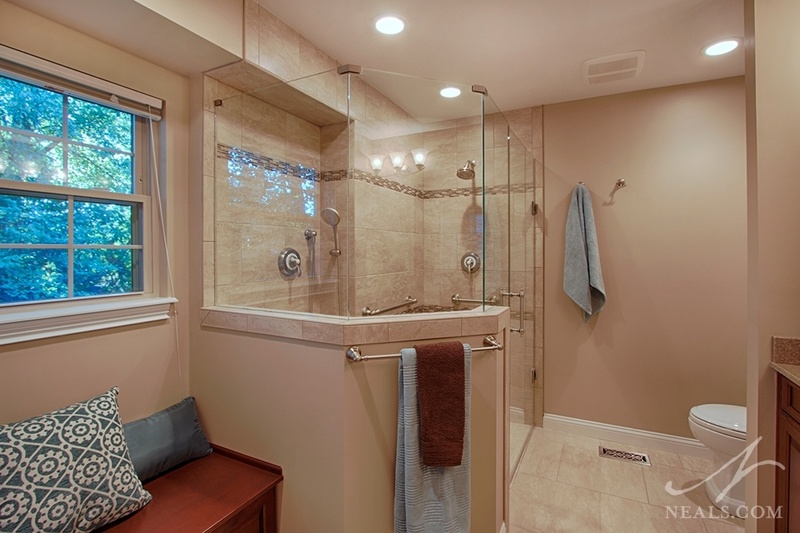 The options for shower fixtures is an extensive list. 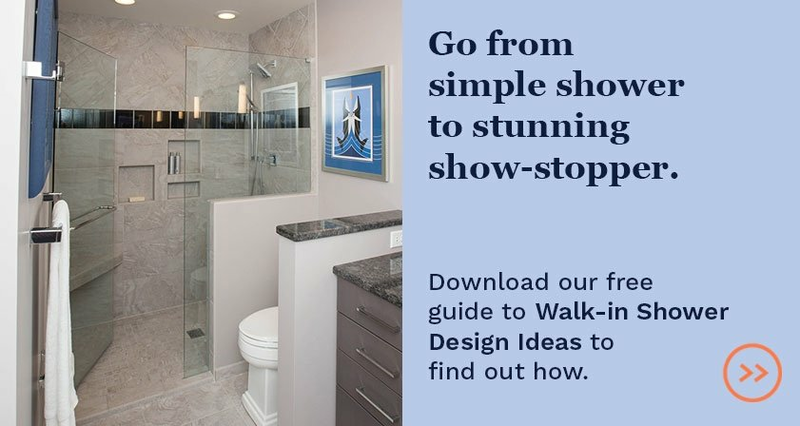 From simple downward heads without bells and whistles, or handheld showers with variable stream settings, to relaxing rain heads, there's a shower solution for every need and mood. Remember, however, that every fixture needs plumbing, and that can add up in your budget. To narrow down to the items that make the most sense, think about the way you need to use the shower, both in the practical sense (getting ready for work), and the casual sense (winding down after a long day). When you do those things, how would you prefer to do them? Can a single, fixed shower head perform all the functions you need, or will you need more? An unobtrusive bench along the back wall of this deep shower in Sycamore Township offers a place to sit. A bench, particularly a built-in bench, is a great inclusion for any shower. Benches fit neatly into the concept of Universal Design, in which a space is created in a manner that anyone, from young to old, can use the space safely. Many homeowners my feel that a bench falls into the realm of luxury, but they can also offer many practical uses. Combined with a nearby hand-held shower head, a bench creates a comfortable spot to sit and wash at ease. Benches can be a variety of shapes and sizes, including taking up the width of a whole wall, or just hanging in the corner. The shape, size, and position of the bench can all be tailored to the shower and homeowner's preferences. 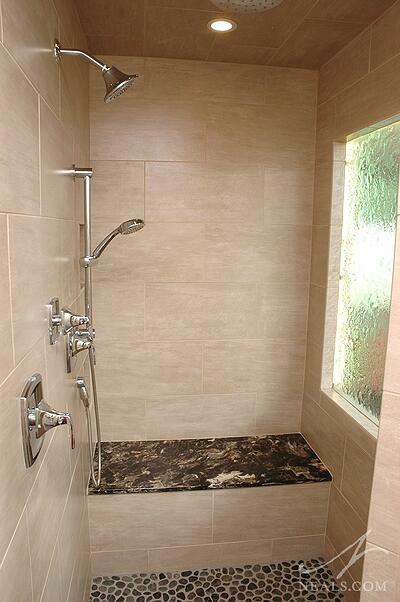 The size of the shower itself will provide a guideline for the scale of the bench. After that, benches should be planned according to the placement of shower heads, faucets, any walls, and sometimes according to outside-the-shower considerations. A tub deck, for example, can extend into the shower to create a bench. Niches backed with the accent tile, hooks for washcloths, and even the handle for a showerhead are all placed inside the concealing half wall in this Lebanon bathroom. 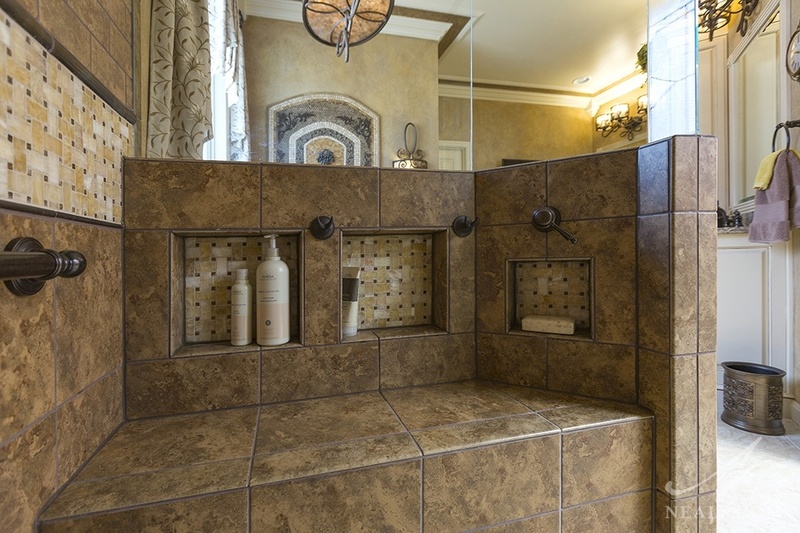 One of the most important features of a shower that can get overlooked when the design and look of the shower starts to take over the planning is the actual place your shampoo and soap will go. It's unfortunate to be in a beautiful, roomy shower, but have to put your shampoo bottle on the floor. Niches are a great solution for this. A shower niche can be a simple square or rectangular space in the wall just tall and deep enough for your bottles. It could also be oversized and function as an accent with a special tile in the back of it. Niches create additional labor in the shower creation, especially when several tiles need to be custom cut, so it's a good idea to really understand your needs and wants with a niche before work begins to avoid costly adjustments. The result, however, is a feature that adds a tailored, functional look to the shower. In addition to overhead lighting, the glass window in the wall of this Sharonville shower lights up for added ambiance. Whether your new shower will have glass walls or be surrounded by full, opaque walls, you'll need the shower space to be lit. Dedicated lighting helps you see what you're doing, and keeps the shower safe. Lighting can also set a mood when you wish to relax and unwind. Think about your shower lighting the same way you would think of lighting in a kitchen. 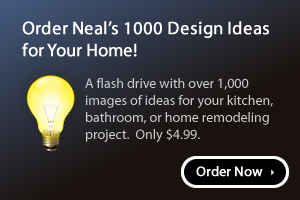 You need task lighting the most, but on occasion, you may want an alternative option for more ambiance. The towel hook next to this Loveland shower lets the homeowner wash and dry in the same place, since room outside the shower is tight. One last thing to keep in mind with your new shower is what happens directly outside of it. Where are your towels kept? Is there a hook or towel bar in reach? Is there enough room for you, or will you be crowded? Is there a mirror or window nearby that could make you feel awkward? Keep in mind that the shower is just one part of the whole bathroom, and while it's important that it holds its own, it also has to play well with the other elements in the room, and function well for you.